The Palm Springs Aerial Tramway, opened in 1963, is a seriously underrated attraction. All the research we did before riding it made it sound like a great way to see panoramic views of Palm Springs and the surrounding Coachella Valley…and that was it. We didn’t realize that it takes you up to Mount San Jacinto State Park at the top of the mountains, and we didn’t know it’s the easiest way to escape the Palm Springs heat for an afternoon. You experience a complete change in ecosystems for the start of the tram ride to the end. There are also skiing opportunities at the state park in the winter months! Imagine going from desert life to mountain skiing in the same day. Heading towards One Tram Way past the old Tramway Gas Station (more about that building and other Palm Springs architecture here) you’ll arrive at Chino Valley, the base of the mountain where you can purchase your round trip tickets at the tramway Valley Station. The tram takes you straight up the mountainside and rotates 360 degrees, giving every person inside the picture-perfect view of the town below and a detailed picture of the mountain terrain as you head up. It’s one of just three rotating cable car trams in the world, the other two located in South Africa and Switzerland. The rotating motion is a little unnerving at times but the views will hopefully keep you distracted from the few bumps and lurches during the ride. Try to grab a spot near one of the windows no matter how nervous you are...it'll be worth it so you don't have to maneuver your camera between people heads for pictures. Once you make it to the Mountain Station, you’re over 8,500 ft above sea level. The visitor’s center provides amazing scenic overlooks. One side provides views of the town below and the nearby wind farms and golf courses, while the other side features the state park and it’s granite mountain peaks and dense forests. It's like looking at two different worlds. From the Mountain Station, you can enter over 50 miles of hiking trails. Some routes lead to ranger stations and picnic areas and others will take you to more overlooks such as the Desert View Trail. This 1.5 mile (2 km) loop guides you to five different scenic viewpoints. The famous Pacific Crest Trail that runs from Mexico to Canada also passes through the park. We hiked through gorgeous valleys and pristine forest for about two hours before heading back down in the tram. 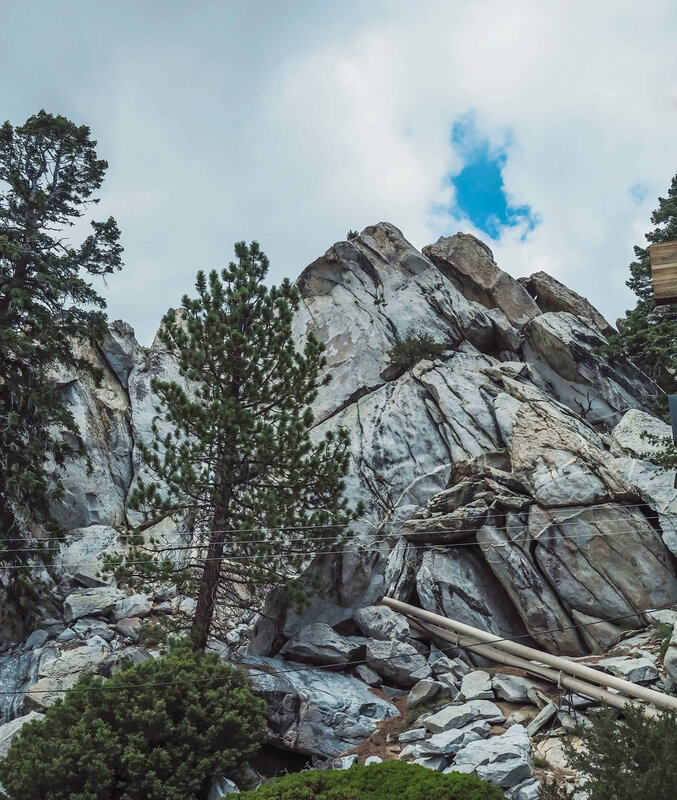 San Jacinto Mountain State Park is a great day trip option from Palm Springs if you want to do something outdoors and don't have the time to drive to nearby Joshua Tree National Park. It's worth a stop just to see the drastic change in climate from the beginning of the tram trip to the end and to bring down your body temperature from the Palm Springs desert heat!